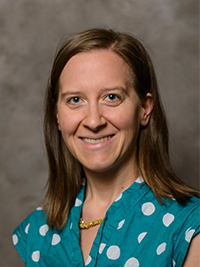 Dr. Ferguson’s lab uses statistical models and stakeholder input to study fish and wildlife populations and support natural resource decision making. We use models to estimate population parameters such as abundance, density, occupancy probabilities, survival probabilities, and movement rates while accounting for imperfect detections (i.e., false negatives when a species is present but not detected or false positives when a species is misidentified). Addressing imperfect detection is essential to generating unbiased parameter estimates with ecological field data. These studies contribute to an understanding of the population’s status and the effects of anthropogenic and environmental features on populations. These ecological models are combined with stakeholder values to address management and conservation questions. We use decision analysis to identify management objectives and evaluate multiple management decision options. We model the expected outcomes of the decision options and evaluate them relative to stakeholders’ objectives. This process identifies an optimal decision option, the decision option that is most likely to generate outcomes that fulfill management objectives. Some specific projects are described below. Infectious hematopoietic necrosis virus (IHNV) is endemic and emergent in Pacific salmonids. 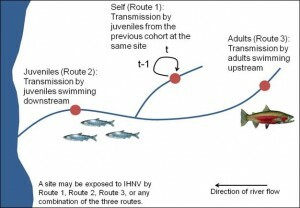 Epidemic IHNV occurs in cultured salmonids in the Pacific Northwest every year, and mortality in juveniles can be 20-90%. IHNV has been studied in the lab, but transmission dynamics seen in the field are not understood. We integrate field and experimental data to develop hierarchical Bayesian models that explain and predict IHNV transmission dynamics. The southern Appalachian region is experiencing high rates of amenity-driven residential development, resulting in the loss, fragmentation, and simplification of forests and grasslands. The southern Appalachian region also has high richness of birds. We used Bayesian occupancy models to relate characteristics of development and habitat to the probability that various migratory bird species occupy sites. We also developed a new model that accounts for false positive detections, false negative detections, missing data, and heterogeneity across time and space. Macon County is a mountainous, predominately forested county in southwest North Carolina that has high biodiversity. There are few land use regulations, so private forests are mainly affected by landowner decision-making. We led meetings with Macon County landowners to help them identify their objectives for their forests, list potential management and conservation options, and evaluate options. The analysis considers forest health, wildlife population dynamics, water quality, erosion risk, fire risk, heritage preservation, and economics and drew on the expertise of academicians, government employees, and non-profit groups. We used a Bayesian decision network to calculate the expected utility of management decision options and identify the optimal decision option. The U.S. Atlantic pelagic longline fishery incidentally catches leatherback and loggerhead sea turtles, which are protected under the U.S. Endangered Species Act. The National Marine Fisheries Service (NMFS) estimates the number of sea turtles that are caught by the fishery annually. There are many statistical methods that could be used to estimate the bycatch of sea turtles, but the suitability of the method predominately used by NMFS and the suitability of other methods had not been systematically evaluated. 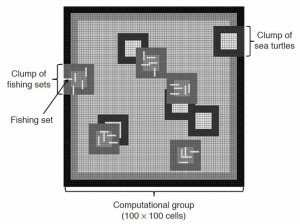 We built a simulation model to evaluate combinations of 4 sampling methods, 3 estimation methods, and 2 levels of data pooling in 7 spatial scenarios. We also generated an estimate uncertainty curve that could be used to calculate the probability that the estimated bycatch is less than the fishery’s Incidental Take limit. Barlow, P.F. and J. Berkson. 2012. Evaluating methods for estimating rare events with zero-heavy data: a simulation model of sea turtle bycatch by the pelagic longline fishery. Fishery Bulletin 110(3): 344-360.